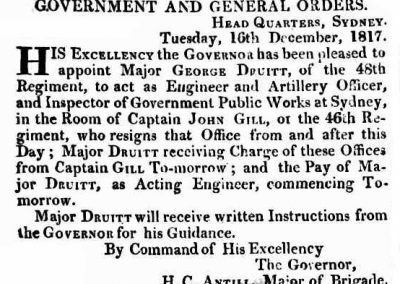 » DRUITT, George & Margaret DRUITT, George & Margaret | Cape Banks Family History Society Inc.
Margaret was the wife of Major George DRUITT who had a distinguished army career in the Napoleonic Wars and the American War of Independence before arriving in the Colony in 1817 aboard the “Matilda”. While on the journey to NSW he had met and formed a relationship with Margaret (nee Lynch) who had stowed away on the ship to be with one of the other soldiers. 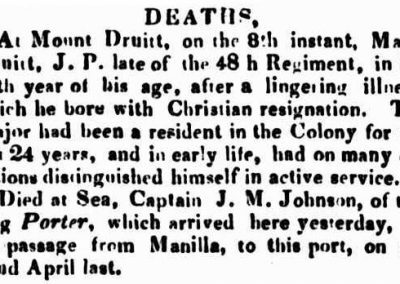 On arrival in the colony they lived together, a daughter Judith was born in 1819 that died as a baby then they had two more sons. They did not marry until 8 years later going on to have 4 more children, 2 boys and 2 girls. 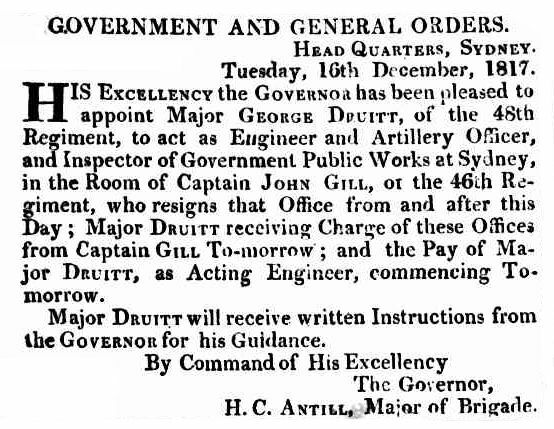 As chief engineer George oversaw the construction and maintenance of roads and bridges by convict labour around Sydney. He was granted land where Blacktown is today and the area known as Mount Druitt and Druitt St in Sydney is named after him. When the Mount Druitt Shopping centre was being built the developers wanted the original headstone to be used in a procession then placed at the entrance to the shopping centre. Permission was granted by the relevant officials but when the stone was being moved it BROKE and crumbled into a mound of rubble. This is a replica of the original headstone which was moved out from Devonshire Street to make way for the building of the railway. 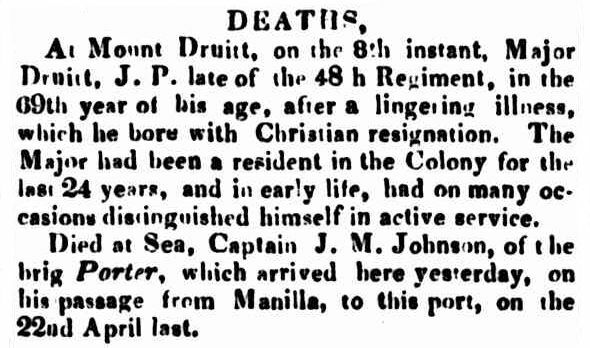 Margaret died 23rd February 1842 and George died at Mount Druitt on 8th June 1842 after a long and lingering illness.